Built in 1907, by Collingwood Shipyards Limited of Collingwood, Ontario (hull #12) as the Helena for the Public Works Department of Canada. In 1956, while working on the Great Lakes. The tug underwent a major refit. Where she was renamed as the Helen M.B. In 1967, the tug was acquired by McAllister Towing Limited of Montreal of Montreal, Quebec. A subsidiary of the Mcallister Brothers Towing Company of New York, New York. Where she was renamed as the Daniel McAllister. However, she was retired from active service in the 1980's. 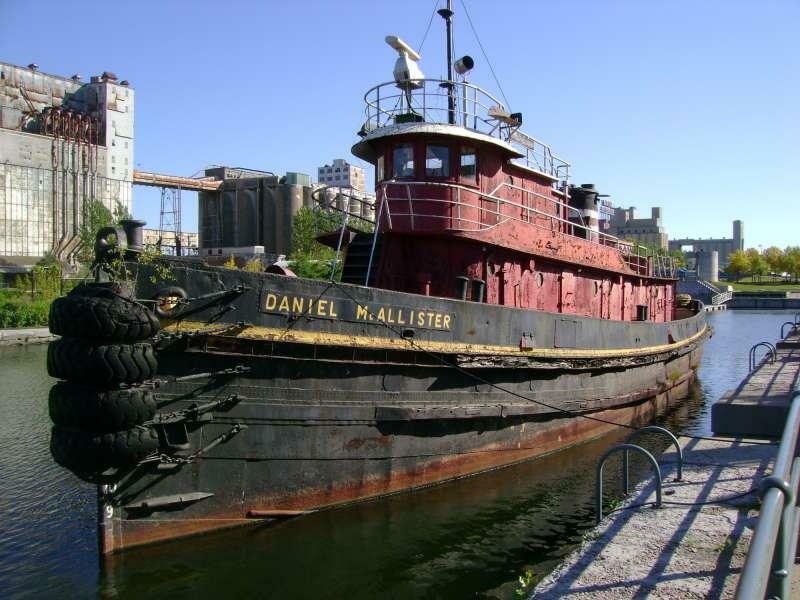 In 1997, the Daniel McAllister was then acquired by the Musée Maritime du Quebec of Montreal, Quebec. The organization partnered with the Old Port of Montreal Corporation to ensure the tug's preservation. In 2008, the Old Port of Montreal Corporation acquired the tug outright. The tug is now a museum piece resting on a concrete cradle (visible when the intermediate pool is drained). Viewable to visitors at the dock of gate number one of the Lachine Canal, off the Old Port of Montréal Quays. At the foot of McGill St. just west of the Café des Eclusiers, in Old Montréal. The Daniel McAllister is the largest preserved tug in Canada. And, the second oldest preserved oceangoing tug in the world. Originally steam driven, she was repowered in the 1940's with a diesel engine from a surplus United States Navy Minesweeper. She was a single screw tug rated at 900 horsepower. Ship Builder: COLLINGWOOD SHIPYARDS, LTD.